Pike House Cottage is a property with character. The accommodation includes a kitchen, living/dining room with log burner, gaming/relaxation room, 2 good size bedrooms and bathroom. The cottage has oil-fired central heating throughout. The bedrooms overlook the enclosed private garden. At the end of the garden there's garden room, sauna, shower and hot tub. 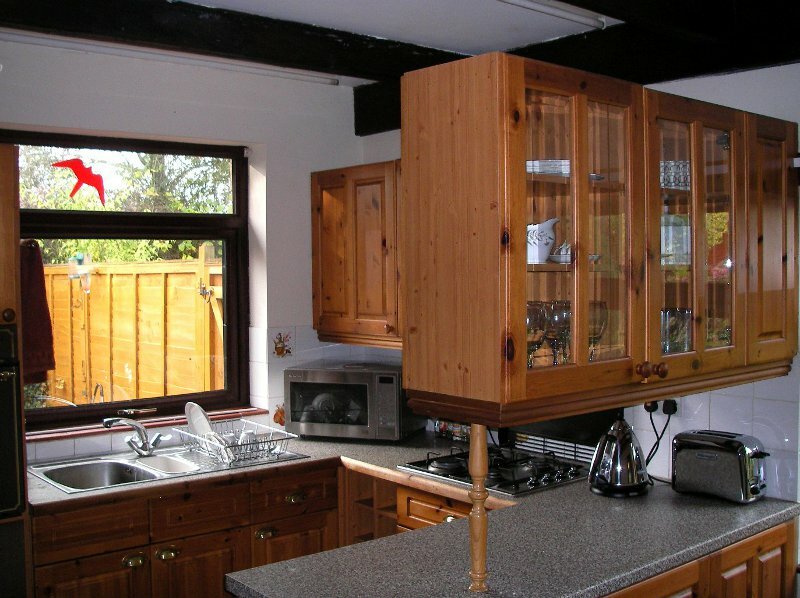 We think it's an ideal holiday cottage for your self-catering accommodation stay in the Forest of Dean, Gloucestershire, UK. The living room is the original part of the property. 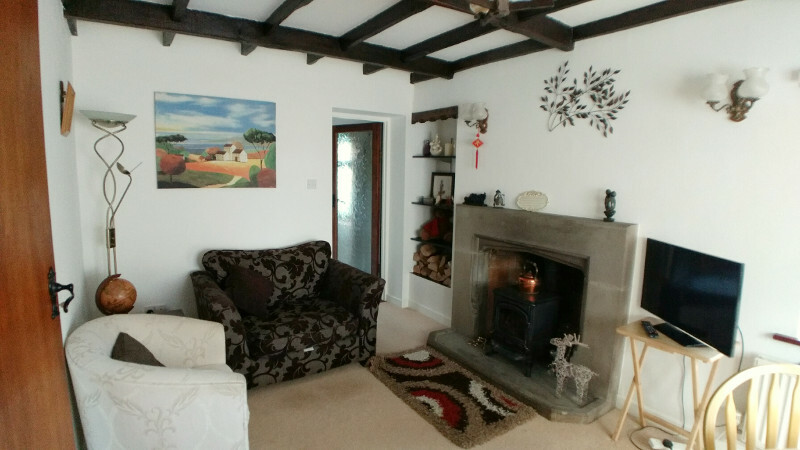 It has stone surround fireplace with log burning stove and ceiling beams. The stone surround fireplace really makes the room. The fire place stove is log burning and as part of your welcome a provision of logs are alongside it. Further logs are outside ready cut for use. Across from the fireplace we have a sofa and armchair. There is a smart TV with HD Freeview and access to all catchup channels. It also has the Netflix app for anyone who has a subscription. Please bring your own player if you want to watch DVDs. At the far end of the room in the bay window of the cottage is a country style dining table and chairs sufficient for six. Next to it there's book shelf with a great collection of bound copies of Reader's Digest short story books. Also, recently we've put a bird identification book there so you can find out what that latest bird is you saw feeding from the bird table. In between the living room and the bedrooms, there's a versatile area suitable for quiet reading or family activities. By the way, we do have WiFi available throughout the cottage with good broadband speeds plenty for streaming catchup channel programmes on the internet-enabled TV. 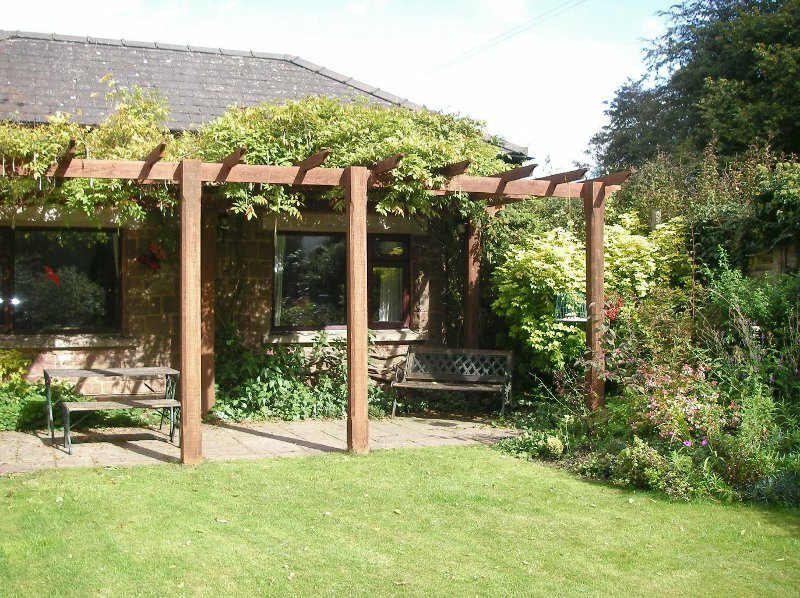 Pike Cottage has two good size bedrooms both of which overlook the beautiful garden. A pergola with a mature flowering wisteria provides shade on that side of the house. 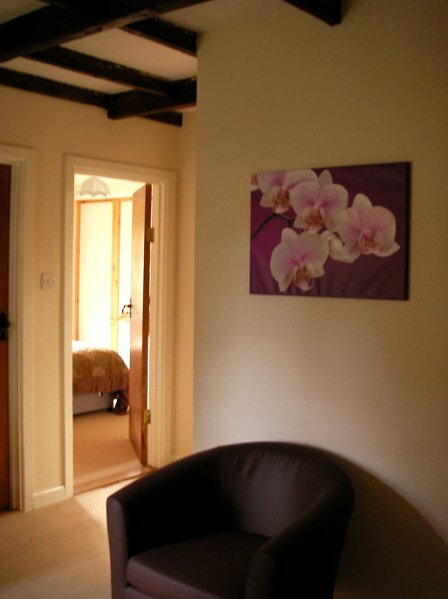 The bedrooms are set up as one double bedroom and one twin bedroom. New for Autumn 2017 onwards: Memory Pocket Sensation Pocket Sprung Mattress by Relyon on the double bed. 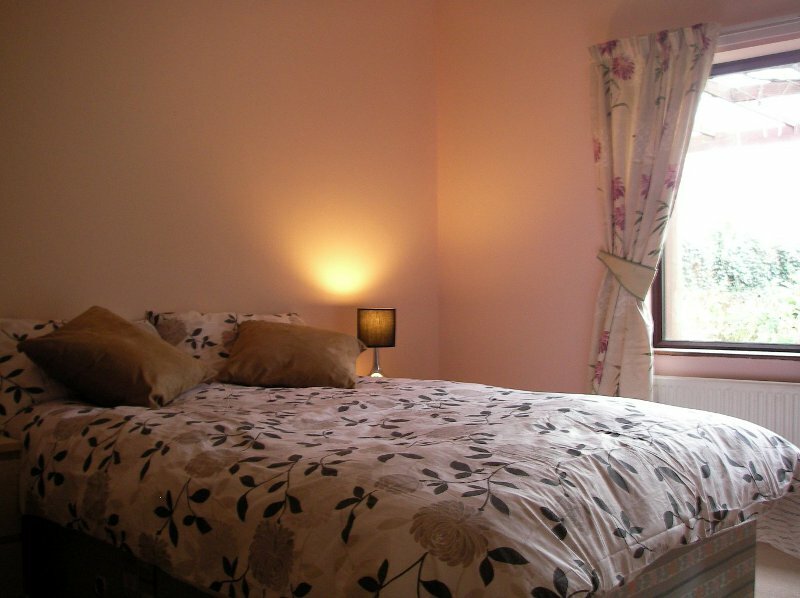 Please note that the double bedroom is the bedroom provided for a one couple or a one person booking. The kitchen has a solid wood stable door from rear patio. Inside there are rustic matching wall and base units and ceiling beams. Facilities in the kitchen include: stainless steel one and half bowl sink with mixer tap, built in gas single oven, built in gas hob with extractor hood, fridge, washing machine and combination microwave. There's also, of course, a kettle and a toaster. We think we've equipped the kitchen with pretty much everything you might need related to meals and drinks. Tea towels are there, corkscrew, toastie maker, electric hand mixer, wok, tea cups, breakfast cups - the list is too long to name them all. Hopefully, we haven't missed providing anything you might turn out to need during your stay. The cottage has two patios - one for al fresco dining and one for soaking up the sun. The sun patio gets warm whenever the sunshines on it even late (or early) in the year. The bedrooms look out into the sun patio and on to the private garden. The property is entered via the driveway which provides off road parking for up to three cars. At the rear of the drive there is also a stone built Workshop where bikes can be securely stored but you will need to request use of this in advance of arrival. Adjacent to the drive there is a garden with circular raised stone bed and large apple tree. The garden area is gravelled with many varieties of shrubs and plants. A gate leads through to the rear patio - our al fresco dining patio - where you can enter the cottage through the kitchen's solid wood stable door. Nearby is a handy loo and coat drying area accessible from the outside. 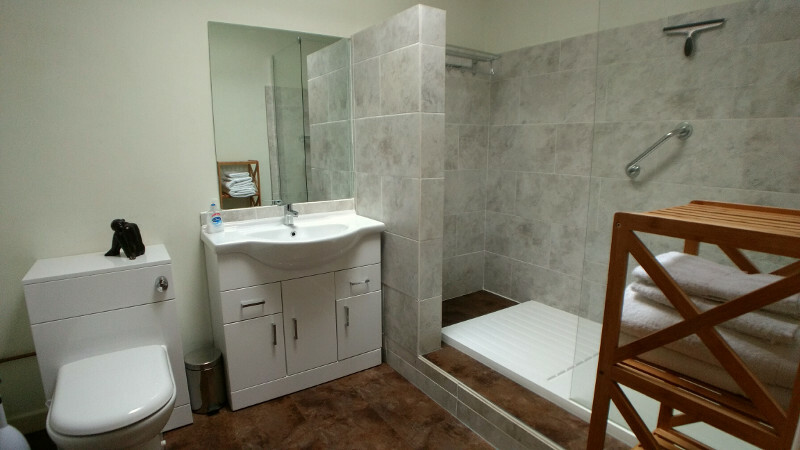 The drying area will be ideal if you are a walker or cyclist staying in the Autumn for example. The cottage enclosed garden is very special. Please see the separate page. Also likewise the hot tub is not to be missed. Again see the separage page. Children are welcome but it should be noted that we do not have a cot or a high chair. The cottage is possibly not suitable for toddlers and very young children as the garden has a pond which is not fenced in. Please send us a message via our Contact Form if you'd like to explore this further.